I'd love to make this out of a bundle of Tsuru! Shelbourne falls! It might look like a waterfall. I really like this, it looks great in Ravena. I think it would be amazing in solids, various shades of blue/teal, maybe darks on the outside and lights toward the inside. Thanks for joining this giveaway, John! I'd probably try it in a small version in a multi-color choice of solids. This looks sort of retro to me... So I am picturing it in cool 60's inspired solids. Would love to see what other great quilt ideas are in the book! If I had the cash I'd buy a great big bundle of architexture as I love that line and think the long panels here would show off the design well. And if I was really well off I'd probably do it in constellations too. Thanks for this giveaway! I will use striped fabrics. I think it would be interesting accent on the turns. Anything from Fig Tree would work for me, thanks for the giveaway. Thanks for the giveaway! I would use the Kimba fabrics by Henry Glass for a low-key yet very fun child's quilt! I would use a variety of purple fabrics! Thanks for the chance to win! I would use a range of yellow, orange and red. I think I would dive into some of my favourite Denyse Schmidt fabrics! Thanks for the chance to win, I'd love a copy of this book! Maybe a bit of my precious Neptune stash!! It would look great I think! I'd use a rainbow of stripes or dots! I would have to try this with bright solids. Thanks for the contest! Looks like a great book! I would use Vintage Modern! i would definitely make this in a bright rainbow. remix ovals. polkadots. sketchy. and so on and so forth. thanks for the chance to win!! I just saw some Simpatico Micromod that might look good in this pattern. I love your quilt as it is so different. But, when I make it,and yes I will make it, it would be in bold colors, maybe plaids. Since of late I am crazy about plaids. What a great giveaway, by the way. I would love to have a go at this quilt in either Splendor 1920 or Salt Water! I think Seascapes by Deb Strain would be great! thanks! Great quilt...I would like to do it in navy and lime, my latest obsession. i think I might have enough Good Fortune by Kate Spain. But suspect I would shop for something new for this. I really like the blues so maybe I would choose from one or more of the wonderful blue collections out there. I'd love to try this one with some solids. Simple but I think it would so cool! I just received a big stack of 1/2 yard cuts of Flea Market Fancy fabric! Too cool! I would use my oh deer fabrics so a bright fun quilt. Thanks for the give-away chance! I would use the stamped line, that I'm in love with. Hmmmm....I'm thinking that I would love to use a bit of my stash with some PB&J....I can't wait for that collection to get to our shop and I'll have to tell them about this book! I'd use Architextures, or Cuzco. For Architextures I'd use a contrasting quilting with soft lines, for Cuzco with its soft forms I'd use a strict geometric quilting pattern. I have a stash of Tina Givens I've been saving foe such a long time. Wow it looks difficult, Can't wait to see the pattern for that one. I am loving Honey, Honey lately. I would use Tula Pink's Coral Salt Water with this one since the shift has a water effect. Love the pattern! Color me retro! I love the big flowers. I like the shift in this design. What a fresh prespective! The Luxe in Bloom would be pretty in this quilt. Thanks for giveaway. I think solids would be best for this quilt. Maybe just bold black, white, and orange? Congrats on the book! I think A Shift in Perspective would look great in fabric with a modern feel and a muted palette, like maybe Comma by Zen Chic. I'd start with some leopard print from Anna Maria Horner and work my way out from that! I think it would be dramatic in solids! Thanks so much for the opportunity! I think this book idea is brilliant! I just got a new bundle of Comma by Zen Chic that needs a pattern. I'm sure I could find one in this great looking book. A friend just sent me lots if Denyse Schmidt fabric that would br great. Thanks for the giveaway. I would probably go with shot cottons, I only have 8 colors so it'd be a great excuse to buy more ;) Thank you for the giveaway! Love the quilt! I think either bold stripes or bold solids. Thanks for the giveaway. 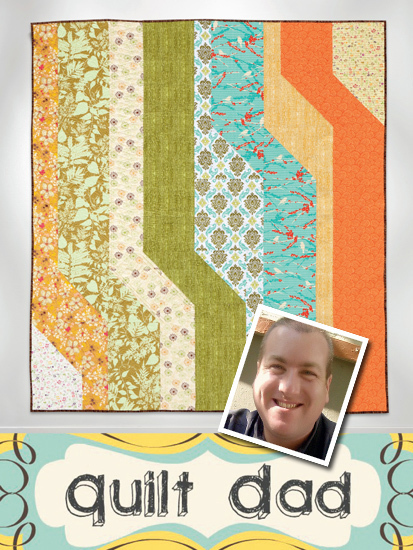 I think Elizabeth Hartman's Blogger's Choice Bundle on Fat Quarter Shop would make this a great modern boy's quilt. Great pattern and the book looks so amazing. I would do it in different coloured prints of bike path in the Penny Lane line! Thanks for the giveaway. I would use a combination of amy butler's latest lines! Thanks! great in this pattern. Thanks. I think I'd use fabrics with lots of grays, blacks, and a hint of yellow mixed in. I have a set of Sultry by Basic Grey from a few years ago that I'd use...lots of browns, pinks, and lime greens! This is such a fun quilt! It would look great in the Ready Set Go line mixed with solids. It would be fun to use the Simply Color line by Moda. Maybe use the ombres to add extra movement to the design. I have a bunch of denyse schmidt fabrics waiting to be turned into a quilt. I think they would be awesome with this pattern! I'd do shades of purple and greens! I would like to use Noteworthy by Sweetwater. I think that would be fun. I would love to use some Constellations! Thanks for the chance to win! I'd like to try this with Jay McCarrol's Center City. I think your design would look great in Oriental prints. But I also could see this in shaded batiks. . . or, my personal favorite, scraps! I'd try it with some solids--probably Konas or Cotton Coutures. Amazing quilt! I think I would use Kona Solids, gradations of the same color (probably blue, it's my favorite). Thanks for the giveaway! Reds and aquas- no particular line. I was just eying Gypsy by Skipping Stones for Clothworks and I'd love to see those paisleys in this pattern. Thanks for the opportunity to win! I think Little Black Dress or Mama Said Sew lines would look great with this pattern. Thank you for the giveaway! I think this would look neat using Angela Walters upcoming line called Textures. I am in love with it already. Thanks for the chance! i would use it with specialty fabrics that have rocks printed mixed with gray solids. Oooh, maybe I would finally get over my fear of an all solids quilt for this! I love the tree quilt as well! How about Vintage Modern? I'd love to win. I'm definitely thinking solids, probably in blues for my son. I would use shot cottons! they are my favorite at this moment! I have a Parson Grey bundle that would make a nice masculine quilt. Love the pattern! 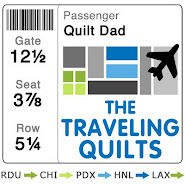 Way to go, Quilt Dad!! I am anxiously awaiting the Black, White and Currant 4 line by Color Principle and this quilt would look wonderful with it. I think solid greys would look good. I've been saving a couple of lines for a special project - Echo or A Stitch in Color. I your pattern would do either of these lines justice. I would love to use some of Denyse Schmidt's new line coming out. Maybe some Laura Gunn large prints! I think it would look really good in the 2wenty Thr3e line. Comma or Architextures. Two collections I can't wait to use. The book looks awesome! I would use Comma. I would use Marmalade. I have a jelly roll I need to use. Thanks for the chance to win a copy. I am so bad at knowing different fabric lines :) I think I would use up some random bits in my stash! Thanks for the chance. I think the Ticklish line would make a happy shift in perpective. Thanks for the chance to win! I would use Simply Color - it is my favourite at the moment! I'd like to make this in those Simply Ombres! :) Thanks for the chance to win! Lately I'm drooling over Comma. I think it would be cool in this graphic quilt. Hard to choose! What an awesome book. Thanks for the chance to win. Fingers crossed. I think I would use indigo crossing - love the blues! I would use blue/teal solids... Although the idea of using Simply Ombres is tempting too! I think I would use Comma by Zen Chic. It would be really cool. I think it would look interesting in one of the Northcott Stonhenge lines or with a selection of star prints. I love the design and this would be something my mom would be able to make. I have got her back into sewing after dementia has hit her badly. She is concentrating on scrappy quilting with strips, but this would make a really nice quilt for some friends that she wants to quilt for! I would like to use some Curious Nature as I think the graphic prints would look wonderful. I would love to use Vintage Modern! I'm really enjoying Jeni Baker's new line "Color Mer Retro"! I think they would make for a simple, yet stunning quilt. I'd use Kate Spain's Cuzco line. This is a great pattern to show off your favorite prints. I would use vintage modern! Teal, grey and red! Congrats! I love your patterns! I would make a black & white, red, and gray Shift in Perspectives Quilt if I won! Thanks for a chance. I would use shades of yellow and reds, all solids, changing it from light to dark from left to right. I think this pattern would look fantastic and totally wild in a combination of stripes, chevrons, a couple solids, a dot or two and maybe some of the cool Constellations fabrics. Honey Honey by Kate Spain! Mmm, pretty! 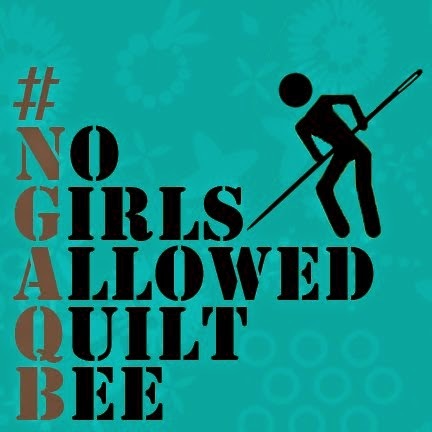 I think your quilt pattern would look awesome in Groovin by Quilt Poetry! Thank you for the opportunity to win this fabulous book!!! I would have to use something from Lotta. I would make it with polka dot prints, a bright cheerful interpretation. Thanks for the chance to win! I so want this book!!! I'd use all solid fabrics, and quilt it in each of the colors, with the thread/fabric colors matched up to stand out the most. I would use Salt Water by Tula Pink, I love that collection and I think it would work great with this pattern. I've been looking for a pattern to make the BIL a quilt and I think yours would suit him well so I'd have to use solids in forest colors since that is his style. I need that book! I want to make something with Cuzco. I also think some solids would be good, some dark grey and bright colours (lime, orange) too! I would like to make this quilt in Comma. I would love to make this with shot cottons--they have their own special Shift! This book looks like a lovely and useful addition to my library. I think Rock & Romance would be a great choice for this quilt! I would make this in Kate Spain's Honey Honey.... the graphics would look great with the straight lines, and the florals would soften it up... wow! Salt Water in the Coral line. Thanks for the chance. Looks like a great book. I would love love love a copy of this book! Thanks for the chance! I just stumbled on to your blog quite by accident. I used to live in Cary and Apex, before moving back to Texas going on 6 years ago. I love that area! Great design, I would love to use Luxe in Bloom. Thanks for the chance to win! This looks like a great book. I love your quilt! I would love a copy of that book. I think maybe I would use the Lizzy House Pearl Bracelets in all those amazing colors. I love it! How aboutLecian s Who Invented the Alphabet, or Michael Miller's ModPod, with solids for either choice. I love this book, too!! 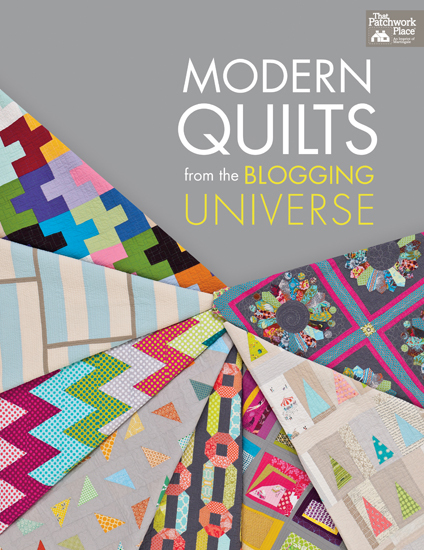 I've got a copy already but if I'm the lucky winner I donate the extra copy to my traditional guild's library as many of the members are really warming up to modern quilts! Yippee! I would love to make it with Kona solids and make it looks like a fractured rainbow. I think I'd use Rob Bancroft's Micro Mod for this. Love the quilt and thanks for the giveaway! Your new pattern is very unique. I'd make it scrappy. Looks like an interesting book, thanks for a chance to win. I'be been eyeing this book since I first heard aabout it. I'd love to have a copy . The quilts look great. I'd make your quilt in the Knauer Frippery line. I think it'd be fun in a preppy- boy kind of color way: red, navy, green-teal, yellow, with solids and some graphics. Maybe metro living circles or stripes. Perhaps it's trite, but I could see this sewn into a rainbow. I would probably use either Aviary 2 or Modern Meadow by Joel Dewberry. Then again, maybe I'd make one of each! Beautiful and congrats! Thanks for the opp. Wonderful design! I wonder how it would like with solids. I would like to use Cruiser Blvd. by Sheri McCulley. I'm not sure of the fabric requirements but I have a stack of Chambray Chateau fabric that I think would work really well. What do you think several paisley type prints would look like with "A Shift in Perspective"? I am going to try one. I made your log cabin pattern as a quilt top with a bunch of leftover pieces I had. It was soooo easy and more forgiving than any quilt I have ever made. (I have a huge problem with matching up the seams in regular blocks.) I call it the snail and my 8 year old grandson can't wait for me to finish it. He wants it bad!!! LOL. Wish I could figure out how to post a pic of the "Snail". I have some beautiful Moda solids that would love to be in this design! Tree of Life by Chong-a Hwang would look really look nice using your design. I think my son would like to have this quilt in grey shades that would fit in his bedroom. Would be different from what I use most of the time (bold colors). I'd like to make it in Tsuru by Rashida Coleman-Hale. This looks like such a great pattern! I'd probably make it in happy fabrics from my stash, supplemented by a Kona solid or two. Very cool pattern. I'd love to see it made up with reds, like a line of French General. Thanks for the review and giveaway. How do I decide what PROFILE to use? Is annon. ok? I'd make it with a variety of white-on-blacks, with bright orange batik running through it, just for fun. What a great book. I love your design and my walls need new quilts. I would use a combination of gray, black and white with a strip in lime green. I would use Textures by Angela WAlters for Art Gallery Fabrics. I'm currently in love with Amanda by Urban Amish. I'd mix in some Free Spirit probably. I love their stuff too. Thanks for the giveaway! I just checked out this book from our library and was browsing through it. I love the book and your design was one I would love to try. I don't know yet what I would use to make it with, I will be visiting my favorite quilt shop this week and maybe I will be inspired. Congratulations on the book, that must be a nice feeling to see your designs in print. I would use fabric from my astounding stash! Thanks for the chance to win! I usually gravitate toward prints, but I think this would look awesome in solids. Hi! i am new to quilting, although i am not new at all! i have been around a while and think it is about time that i broaden my horizons. i happened onto your blog today through Twitter. i want so much to win this book. i am not sure how any fabrics will change perspectives, but i love florals, especially roses in pink, red, and yellow with green backgrounds or leaves. i also love tiny polka dots, like pink on green. Anyway, a combination of these with maybe a solid thrown in would be for me beautiful. BTW, i am happy i found you. i am loosebgoose on Twitter. I have a collection of red, white, and blue fabrics that would make up a great picnic blanket! Checks/stripes and spots would be my choice. All of these images are looking mind blowing thank you very much for the sharing. I would use "ombre" colors - white to tan...love the pattern! 4/2/13 Hey John, do we need to get a search party out for you? Hope everything is ok; just worried 'cause it's been a while since you posted. I have to agree with Sherry. JOHN?? Where are you? I have some beautiful Asian fabrics that would look great in this quilt. April 6th - John where are you? from MarciaW. Blue is my favorite color and I love those blues of the Dear Stella Ravena collection. I have a Red Rhapsody fq bundle from Connecting Threads and wonder how the quilt would look in red, white-cream, and black.